We would like to start by saying Thank You to everyone for their kind donations. We raised a Cablelynx record total of £300! On Saturday the 17th we started our Stepper League which got so competitive that we completed our goal of 1 million steps, 2 days earlier than planned! From Monday the 19th, our Cake sale was off to a flying start. Over the week, the Cablelynx team generously donated lots of delicious cakes, bakes and savouries. Everyone working here (or even visiting us) were more than happy to purchase some of our tasty treats! 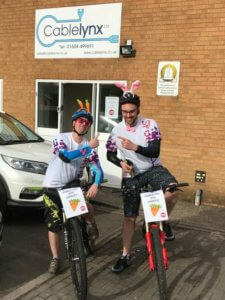 Finally we finished the week on the 23rd with Mark Collins and David Burn’s fancy dress bike ride and the raffle. Thanks to everyone who voted on our web page and extra thanks to those who donated on our Sport Relief giving page. Mark and David were great sports and wore fancy dress for their whole ride home. As you can imagine, this created lots of smiles for our team and the public. Cablelynx employees also all came in wearing sports wear to get into the sporty spirit! The raffle was a success with over 30 prizes that were charitably donated by everyone here at Cablelynx. It gave us a well deserved break from busily making cable assemblies. Delivery drivers and Cablelynx employees alike purchased tickets to win some of the lovely prizes we had on offer. Sports Relief 2018 all together raised £38,195,278 which I am sure will keep rising over the next few days.